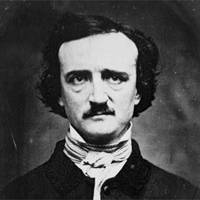 EDGAR ALLAN POE (1809 - 1849) was an American writer best known for his poems and short fiction. He deserves more credit than any other writer for the transformation of the short story from anecdote to art. He virtually created the detective story and perfected the psychological thriller. He also produced some of the most influential literary criticism of his time - important theoretical statements on poetry and the short story - and has had a worldwide influence on literature. For more on Edgar Allan Poe, clich HERE.